It’s a well known fact that Shostakovich, Prokofiev and other leading Soviet composers suffered badly as a consequence of the notorious Zhdanov Decree, issued under Stalin’s direct orders, in 1948. The Decree meant that Prokofiev was virtually forced to renounce his own work, with the result that he spent his last years mostly in artistic seclusion, virtually ignored by the state until a year or so before he died. Amongst Prokoviev’s friends during those last years were the pianist Sviatoslav Richter and the cellist Mstislav Rostropovich. They inspired the composer to continue his work and he in turn dedicated his 1947 Ninth Piano Sonata to Richter (considered by many as Prokofiev’s masterpiece for the piano), and for Rostropovich he wrote an amazing group of late works among which was the Sonata for cello and piano, premiered by Rostropovich and Richter in Moscow in 1950. The three-movement Sonata is perfectly realised for cello and piano which remain virtually equal partners throughout, the dialogue between the instruments showing Prokofiev at the height of his powers. The disc includes the fragment of the Tenth Sonata (1952) which gives us a tantalizing glimpse of what might have been. The two Sonatinas Op.54 are both delightful miniature Sonatas each lasting less than ten minutes. 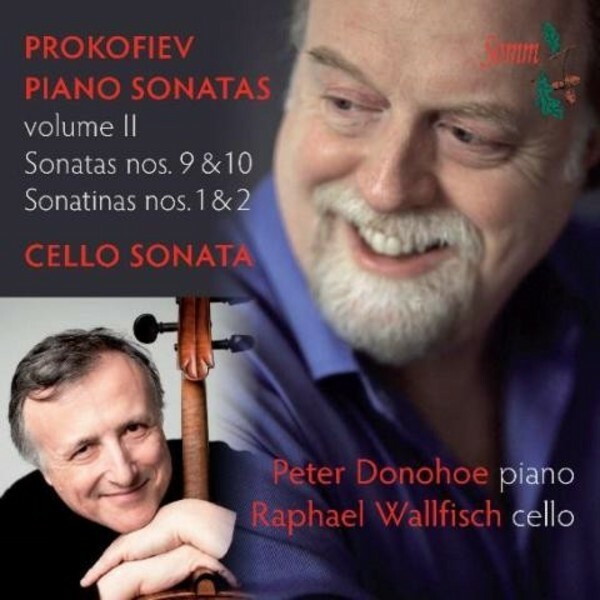 The two illustrious artists, Peter Donohoe and Raphael Wallfisch, partner each other affectionately and in perfect harmony in this recording. They are each enormously successful, with long established careers in their chosen field and need no recommendation.